SofTutor Second Life (academic) - Quick, Follow Along, Learn by Doing training! SofTutor for Second Life (academic) gets teachers and students up to speed in Second Life's free virtual 3D world in minutes, so teachers can focus on teaching their students with the learning capabilities of the virtual world. Barrington, Illinois - March, 23 2010 — New Vision Software, Incorporated (NVSI) announces the availability of the free SofTutor for Second Life - Academic version. SofTutor for Second Life Academic reduces learning time by up to 70 percent with its easy-to-use 100% follow-along, learn by doing video-based training method. In addition, learners can consult specific “how to” information without leaving Second Life using SofTutor’s unique, resizable overlay windows. With 145 specific topics, learners quickly become skilled at navigating, communicating, playing, building, shopping, driving, etc. within the Second Life 3D virtual world. Originally created for the International Society for Technology in Education (iste.org) 2009 Conference to introduce more teachers and students to Second Life and explore the 3D virtual world learning capabilities. A collaboration between imohax.com and New Vision Software's K-12Kids.com, it successfully taught students and teachers how to go from no experience in Second Life to an intermediate level (builder). This version is based on the new SofTutor Learning System v3 - Performance Based Learning platform which allows instructional designers the ability to mix and match training content from various sources to build customized training. This product was created within several days by mixing public domain content with content developed in-house. New Vision Software, Incorporated, revolutionizes software training by combining overlaid hands-on video learning with easy to follow examples. Since 1995, over 250,000 users — from major universities to Fortune 500 companies to those learning at home — have reduced their learning time by at least 50 percent while increasing their retention of the material. Customer satisfaction has remained at 99.976 percent since 1995. With the new SofTutor Learning System, teachers, subject matter experts, help desk staff and others can easily create customized training programs with their own content while users can find and display specific training information without leaving their current application. For more information, please visit our website at http://www.nvsi.com. 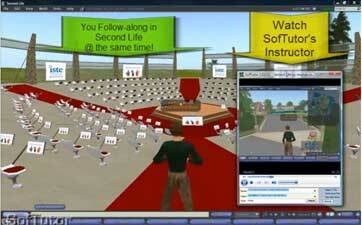 SofTutor is a registered trademark of New Vision Software, Incorporated. Second Life is a registered trademark of Linden Research, Incorporated. Some content copyrighted imohax.com.